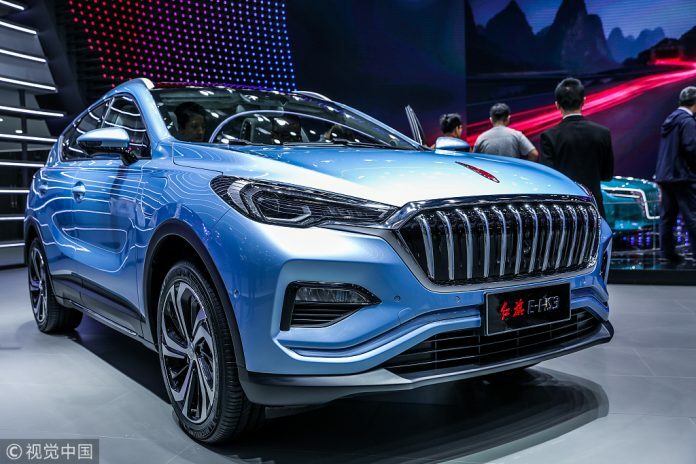 CHANGCHUN – Chinese automaker FAW Group is set to launch a new Hongqi SUV model to target private buyers, the group said at this year’s World Internet Conference (WIC) that closed Friday. The luxury SUV model Hongqi HS7 is scheduled to hit the market in 2019. Meanwhile, the company’s first Hongqi electric SUV, unveiled at the Beijing International Automotive Exhibition this year, is also scheduled to hit the market in 2019. Both the SUV and electric car models are being launched to explore the private car market. Earlier this month, the company unveiled a partnership with Baidu to develop a near-full autonomous vehicle in 2019 and achieve mass production by the end of 2020. The company’s first fully autonomous Apolong minibuses, rolled out earlier this year, are now running in over 10 locations. Hongqi has set sales targets of 100,000 cars in 2020, 300,000 in 2025 and 500,000 in 2035, said FAW Group Chairman Xu Liuping. It will introduce 17 car models, including electric and SUV models, by 2025. The first Hongqi, or Red Flag, car was made in 1958. Hongqi is one of China’s iconic sedan brands and has been used as the vehicle for parades at national celebrations. Established in 1953 in the northeastern Chinese city of Changchun, FAW was the first automaker in China.